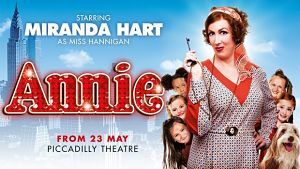 Full casting has been announced for Annie the Musical which will starts rehearsals today and opens at the Piccadilly Theatre on 5th June (previews from 23rd May). Joining the previously announced Miranda Hart as Miss Hannigan will be Alex Bourne (Mamma Mia!) as Daddy Warbucks, Holly Dale Spencer (Sweet Charity) as Grace Farrell, Jonny Fines (Grease) as Rooster and Djalenga Scott (Grease) as Lily. The title role will be shared by three actors, 13 year-old Madeleine Haynes, and 12 year-old Lola Moxom and Ruby Stokes. Annie's dog Sandy will be played by a 4 year-old Labradoodle called Amber. They will be joined by ensemble members Keisha Atwell, Sophie Ayers, Bobby Delaney, Nic Gibney, Patrick Harper, Ben Harrold, George Ioannides, Megan Louch, Benjamin Mundy, Ben Oliver, Heather Scott-Martin, Anne Smith, Kate Somerset How, Katie Warsop and Russell Wilcox.